The department of Pathological Physiology was organized in 1933. Since this year to 1946 the heads of the department were prof. N.E.Gekler, A.A.Znachkova, D.S.Chetvertak, professors S.M.Lejtes and P.P.Ochkur. In 1946-1969 years the department was headed by professor Glozman Osip Sergeevich, the outstanding scientist who brought the considerable contribution to pathophysiological science. He created the Kazakhstan school of pathophysiologists. For this period the scientists of the department created a technique of total and partial exchange hemotransfusions. It was proved that the technique is necessary for treatment of exogenous and endogenous intoxications. According to results of the researches, professors O.S.Glozman and A.P.Kasatkina published 4 monographies; A.P.Kasatkina, H.S.Nasybullina, S.I.Karabaeva, M.S.Saulebekova received the degrees of Doctor of Medical sciences. 17 scientists received the degree of candidate of medical scientists. In 1969 -1991years the department was headed by professor Nasybullina Halida Sadykovna. She directed the researches devoted to pathogenesis of acute blood loss and transfusion therapy at animals with experimental diabetes, hypokinesia and chronic alcohol intoxication. She was the supervisor of 14 dissertations for the degree of candidate of medical sciences. She was the redactor of 2 books of scientific researches. 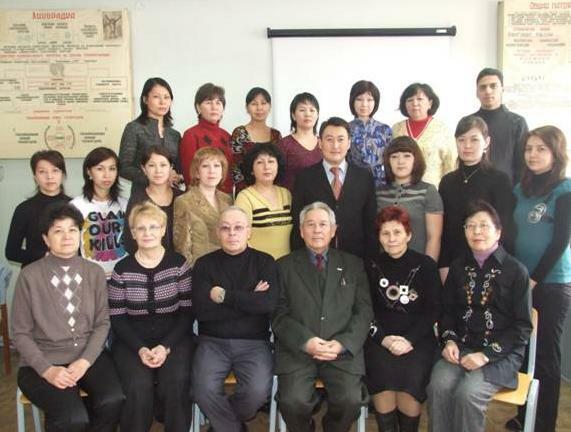 In 2003-2007 years the department was headed by the associated professor Karynbaev Shabaz Sibugatullovich and doctor of medical sciences, professor Udartseva Tatyana Pavlovna. The scientific researches of prof. Udartseva were devoted to problems of ecological pathophysiology. She published about 100 scientific and education-methodical works, including, the monography “Mehaknizms of adaptation to combined influence of lead and restriction of movements”. She was the supervisor of 2 candidates of medical sciences. During this period modern innovative methods of training were carried out: educational video films about experiments on laboratory animals, multimedia presentation of lectures (Ryspekova N.N., Kasenov B. Zh), computer training programs (S.S.Karynbaev, N.N.Ryspekova). From 1991 till now the head of the department is doctor of medical sciences, professor Nurmuhambetov Adilman. He is the founder of ecological pathophysiology in Kazakhstan. He has brought the essential contribution to studying of deep mechanisms of damage due to anthropogenous pollutants, such as, exhaust gases of the diesel engine and heavy metals. His works are devoted to new methods of pathogenetic correction of lesions with the preparations received from local vegetative materials (Radix Glycyrrizae). Comprehensive investigations proved the protective effects of local sorbent from Chankanaj deposit, nanosorbents, received by chemists of Al-Farabi University, the immunomodulators synthesized by chemists of Bekturov A.B. Institute of Chemical Sciences. Professor A.N.Nurmuhambetov was the supervisor of 3 doctors of medical sciences (T.T.Meldehanov, 1995; T.P.Udartseva, 2002; D.A.Adilbekova, 2009) and 16 candidates of medical scienses. Professor A.N.Nurmuhambetov has published about 200 scientific works, 11 books, is the author of the scientific monography «Antioxidant protection of myocardium and brain chemical damages», four certificates confirming inventions. He is the redactor of 8 books with scientific research materials. He organized scientific conference “Pathophysiology urgent questions in modern medicine» (1990, Almaty) and the International scientific-practical conference «Pathophysiology and medicine urgent questions»(2008, Almaty). Pathophysiologists of medical universities from Kazakhstan, Russia, Kyrgyzstan took part in this conference. In 2009-2010 years results of scientific researches of the department have been published in Italy, the United Arab Emirates, China. Now scientific researches of the department are devoted to the university scientific program «Working out of antiageing models in maintenance of active longevity of senior citizens», to studying the mechanisms of aging and searching the new ways of life prolongation. The pathophysiology department is one of the university leaders in organization of educational process. The department actively uses innovative methods of training and control of knowledge, including the publication of education-methodical literature, improvement of test tasks and clinical cases, creation of computer training programs, multimedia presentations of lectures with video rollicks display, video films with pathological processes and illnesses modeling . Students of all the faculties are provided by modern educational literature in Kazakh, Russian and English languages, including those written by department teachers. Professor A.Nurmuhambetov published textbooks of pathophysiology in Kazakh language (Almaty, 1995. -338p., Almaty, 2000.- 567p., Almaty, 2007.- 698p. ), the textbook of clinical pathophysiology in Kazakh language (Almaty, 2010.- 976p. ), the text book «Pathophysiology in schemes and tables» (Almaty, 2004. – 245p), “¥рык дамуы мен балалык шақ ауруларының патофизиологиясы» (Almaty, 2006. – 192p. ), 6 Russian-Kazakh dictionaries of medical terms. Under the edition of professor T.P. Udartseva textbooks «Pathophysiology for out-of-class work» (Almaty, 2006. – 254 p.), «Test tasks of pathological physiology» (Almaty, 2007. – 504 p.) in Russian and Kazakh (with Baibory M. B.) were published. There are electronic textbooks and textbooks on electronic carriers. The collective of the department prepared new education-methodical documentation according to State standard of education 2006 in Kazakh, Russian and English languages. Educational complexes were written for all specialties. Annually teachers of the department are curators of student’s groups, since 2008 they supervise 3-year students of General medicine faculty. Traditionally the department organizes conferences «Medical students against drugs» with the invitation of narcologists and workers of law, organizes curator’s hours devoted the history of KazNMU and the life and work of the outstanding scientists of our university, devoted literature and art of Kazakhstan. Spiritually-moral education and mercy among students has found the reflection in carrying out the work in Almaty Children’s home № 1. Students with enthusiasm and love organize parties and performances for children. The activity of the department is directed on formation of the highly skilled meditian, the real citizen of RK capable to professional, intellectual and social creativity.